Retired government forest ecologist Jim Pojar and Skeena Wild have just released a report on forestry and carbon. The report refutes some common myths and shows why the protection of old-growth forests is critical in sequestering carbon and addressing climate change. The report, entitled “Forestry and Carbon in BC,” has been reviewed by UNBC academics and independent researchers. Pojar, who worked for the BC forest service for 25 years, has also written an opinion piece debunking these common myths. You can read and share it here. BC’s forest management is making climate change worse—an alarming situation when our forests should instead be our best ally in the fight against climate change. Unless the BC government wakes up and takes far-reaching action to strengthen conservation and improve forest management, our provincial forests will continue to contribute to climate change instead of slowing it down. 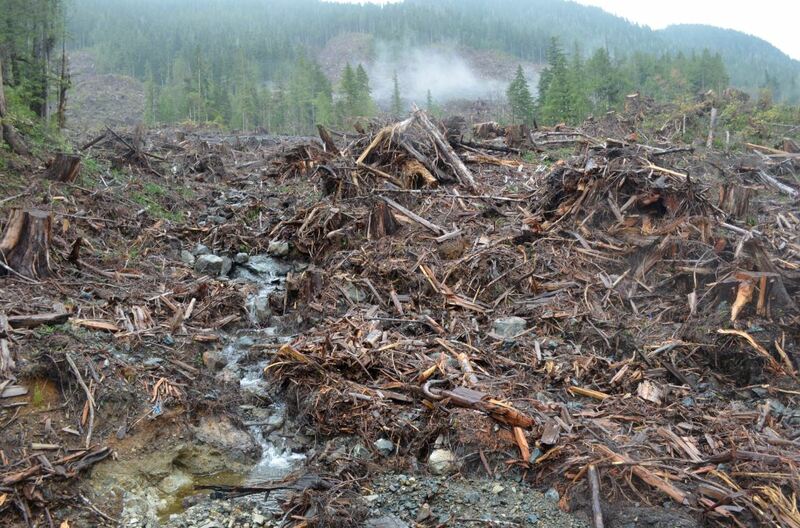 Vancouver Island clearcut. Photo by Mark Worthing. The massive and growing forest emissions from our province are a result of destructive logging, pine beetle outbreaks and wildfires. BC’s forests used to absorb more carbon than they released until the early 2000s when they became a net source of carbon. The situation has gotten much worse in the last two years. Both the 2017 and 2018 wildfires burned more than 1.2 million hectares of the province, eight times more than the ten year average. Combined with skyrocketing emissions from fires and a reduced ability of damaged forests to sequester carbon, the province must expect more than 200 million tonnes of “uncounted” annual carbon dioxide emissions from BC’s forests, once data becomes available for 2017 and 2018. The government should be setting and delivering on targets for protection of carbon rich old-growth, timelines to phase out slash burning, and ensuring all communities at risk of wildfires are fully participating in Fire Smart programs. BC’s hidden and uncounted forest emissions in 2017 and 2018 will be three times higher than the province’s total officially reported emissions. These growing forest carbon losses and steps to reduce them are summarized in the Sierra Club BC report Hidden, ignored and growing: B.C.’s forest carbon emissions. In 2016, provincial emissions increased by 1.5 per cent compared to 2015 and were only 2.9 per cent below the baseline reporting year of 2007. In light of economic growth and lack of new climate action, it can be anticipated that emissions will likely not have been reduced through 2017 and 2018 (for which data is not yet available). 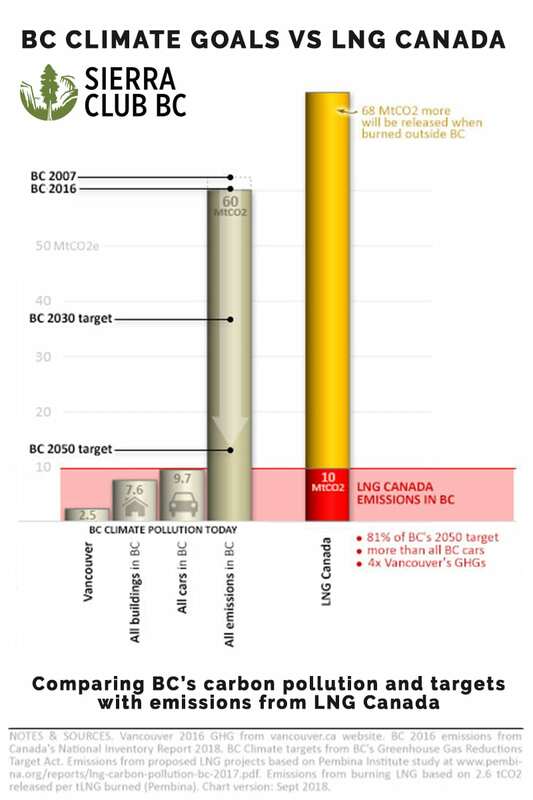 “This latest data makes the recent CleanBC plan announced in December all the more important and urgent. It’s these kind of tangible steps—and more—that are needed if we are to finally begin to reduce climate pollution,” said Jens Wieting, senior forest and climate campaigner with Sierra Club BC. “Yet the government didn’t say a word about the ongoing growth of B.C.’s emissions, as shared in data posted on the government’s website later that same day. “The B.C. government promised accountability as part of their climate strategy. Accountability begins with a real effort to share pollution information with the public. 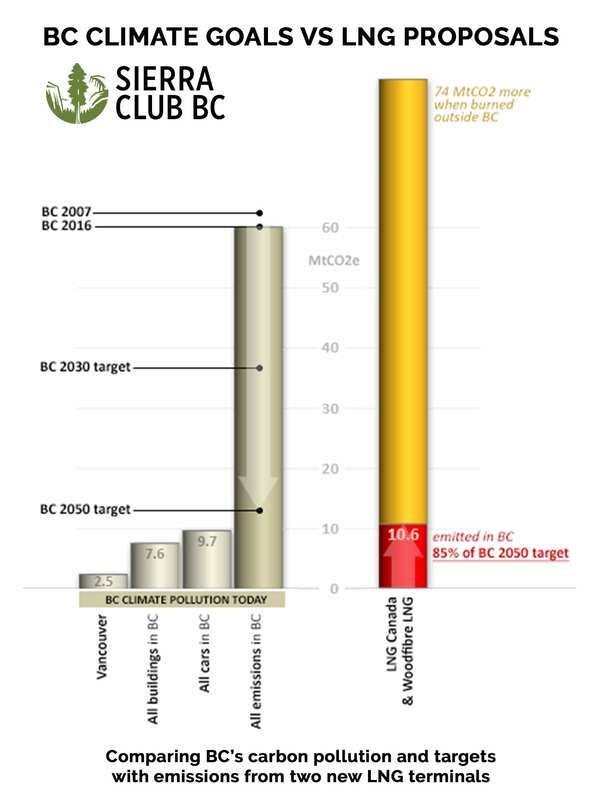 It should not be the task of Sierra Club BC to send out a press release about the fact that B.C.’s emissions continue to go up,” said Wieting. “The province has shown leadership with CleanBC, outlining how some of the needed emission reductions can be achieved. We need the same leadership when it comes to informing British Columbians about the inconvenient truth that our pollution continues to grow at a time when the province is still cheering on new fracked gas infrastructure. To meet B.C.’s 2030 provincial climate pollution reduction target, B.C.’s annual climate pollution must be reduced by about 24 million tonnes—from roughly 62 million tonnes today to roughly 38 million tonnes in 2030. This will require an average reduction of two million tonnes, or more than three per cent per year, for each of the next 12 years. The CleanBC plan showed steps to deliver 75 per cent of the required reduction to meet the provincial 2030 goal, but it remains unclear where the remaining 25 per cent will come from. And much more will be needed in order to meet B.C.’s legislated 2050 target (a reduction of 80 per cent compared to 2007). The provincial math assumes that building the Coastal GasLink pipeline and one half of the LNG Canada project will cause about four million tonnes of additional annual carbon pollution. This would be equivalent to two years’ worth of the needed annual reduction. However, the Pembina Institute estimates that if LNG Canada and its Coastal GasLink pipeline are fully built, additional emissions will be roughly nine million tonnes, equivalent to 4.5 years of the needed reduction in the next twelve years. The B.C. government has still not presented any binding mechanism that would stop LNG Canada from building the second half of its project, even if this addition makes it impossible to meet B.C.’s emissions targets.